Want MLS properties on your site? Read more about our IDX service here. Need more sites? Add additional sites to any plan for just $30/mo! 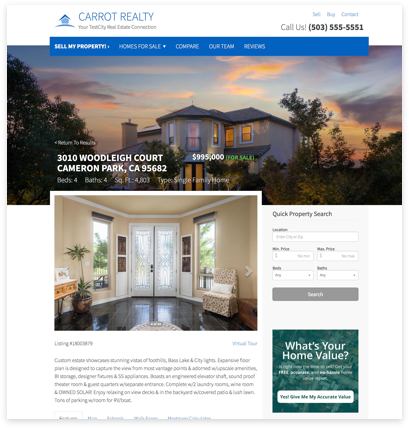 Sign up today and we will work with you to customize your Carrot site with real MLS properties – simple, affordable, and designed to convert your visitors into leads! Sign up today, and add IDX to your site starting at $50/mo + your MLS pass-through fees. I was laid off from my job in June and decided to go full-time into wholesaling and purchase Carrot even though my wholesaling business was in debt. I just closed two deals in the last two weeks and am closing on one this week. 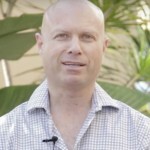 I started leveraging Carrot websites and not only was I able to claim the number one ranking but I get leads consistently. Carrot has become one of the biggest assets of my real estate business. Nope. Unlike other real estate agent website services, there are no setup fees to get started. If you choose to add IDX there are fees related to the IDX setup, but we don’t require AgentCarrot clients to add on IDX if you don’t want to. Just pick a plan and launch a site. Yes, we sure do. Prices start at $50/mo + pass-through fees from your local MLS and you can add IDX to your site after you join above. You’ve probably noticed how effective Carrot is with helping our clients rank high in Google. That is a result of a combination of factors we’ve built into the Carrot ecosystem. The technical architecture of the websites, the SEO strategy built into the content flow, and the automation of the first 60% of the on-page SEO are all a huge part of what gives our clients an advantage. But for competitive phrases, an ongoing SEO effort is usually required. Leverage our training and coaching calls OR hire it out through our marketplace. Can I move my current website to Carrot? You can move your domain over to Carrot. Your site, will not come over but if there are certain things (like logo, testimonials, content, etc) you can upload them in your Carrot account. What makes Carrot better than other website builders? Wow, this could get long. AgentCarrot isn’t out to win design awards. We focus on data driven websites… which means we are constantly testing our websites to make sure they perform. For more information check out our Carrot Methodology.